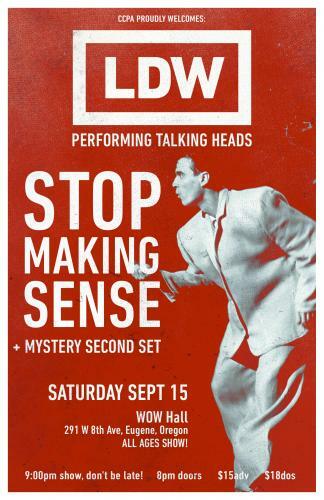 On Saturday, September 15, the Community Center for the Performing Arts proudly welcomes LDW (Life During Wartime) performing the music from the Talking Heads’ film Stop Making Sense. In the summer of 2013 a group of Portland, Oregon musicians got together around the love of Talking Heads music. Especially that of the epic 1984 concert film, Stop Making Sense, which they consider to be the most brilliant concert film of all time. They began to perform with a 7-piece lineup that was inspired by that particular movie and time period. “There was so much funkiness, movement and excitement to the music in that movie and we just knew it would get people excited and feel fresh,” says Lawrence Orleck, co-founder and singer in the band. For LDW, every performance matters, and it’s with that mantra the band had in mind in the studio while recording their first vinyl EP, Movement in a spirited manner Vol 1. The new EP is Vol 1 of a 3-part series of EP’s that LDW plans to release. “The album format is so flexible these days and, frankly, a bit irrelevant so we decided to just do these two sided vinyl EP’s with 4 songs each. This first one came out February 2018. We named it Movement in a spirited manner because for the last three years we have been enthralled with the excitement and motion of our fans. They get down, big time,” Lawrence muses. The band is performing Stop Making Sense, Talking Heads and original material in premier venues around the country. Tickets are $15 in advance and day of show. Doors open at 8:00 pm and showtime is 9:00.